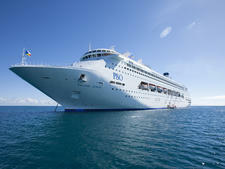 Editor's Note: Pacific Eden left the P&O Cruises Australia fleet in April 2019. 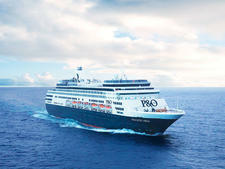 The vessel has been transferred to Cruise & Maritime Voyages and renamed Vasco da Gama. Pacific Eden is the ideal ship for those whose love of the finer things in life is larger than their cruise holiday budget. With an array of glamorous bars, sophisticated (fee free) specialty dining venues, attractive public spaces and first-class musical entertainment, this well-priced ship over-delivers in many areas, especially if you pick up a discounted fare. After a multimillion-dollar refurbishment in 2015 and further upgrades during another dry dock in August 2017, the most impressive aspect of Pacific Eden is its chic new look. From the smart striped loungers on the pool deck to the classy black-and-white photographs lining the walls of Angelo's, the specialty Italian restaurant on Deck 8, Pacific Eden looks impressively luxe for a mid-priced cruise experience. However, in some ways, this is also the ship's biggest downfall. Not because Pacific Eden doesn't deliver on its promise of a fun, affordable and enjoyable cruising experience -- for the most part, it does -- but because the upmarket surrounds make it easy to forget that this is not a five-star ship. Provided you keep your expectations reasonable, there is a lot to love. Angelo's (Italian) and Dragon Lady (Asian), the stylish specialty restaurants, are free of charge. Brave the queue on embarkation day and snap up a prime time slot for your two allocated bookings -- one at each restaurant. You can dine at these restaurants again later in the cruise, if there is space available -- something that isn't widely publicised. Three conference rooms were used to host activities throughout our cruise, ensuring there were multiple entertainment options to choose from throughout the day, from movies to origami making and meditation. Bar areas also do double duty as venues for the daily activities program. While having the late afternoon cocktail hour at The Dome interrupted by a salsa class may not appeal to everyone, we enjoyed the energy this brought to the ship. If your bar is gate crashed by the activities team, there are plenty of other spots to enjoy a quiet drink. On warm days, a sunlounger in the child-free Oasis is the perfect spot to sip a pina colada and soak up the rays. Mix Bar has an innovative cocktail list, while the Blue Room has an appealing selection of wines by the glass and an espresso machine. As evening descends, first-class musical entertainment adds an extra dimension to the onboard entertainment. From sophisticated jazz to a funky R'n'B band and a cocktail pianist with a crush of adoring fans clustered around the piano, there are tunes to suit every taste and mood. Singers and musicians also switch around to form different bands on certain days, and participate in late-night jams and musical challenges. The band members seem to enjoy these sessions as much as the passengers, with spirited competition between musicians increasing the sense of fun. Add a talented cast of singers and dancers, plus a couple of comedians and a magician in the main theatre, and it is unlikely you will be in bed early. Pacific Eden attracts a diverse range of cruisers, from young-at-heart seniors to parents and singles in their 20s to 40s, as well as groups of friends and multigenerational family groups. This is a laid-back cruise experience which means it is not uncommon to see shorts, T-shirts and thongs in the bars, even during the evening, however most people make an effort to dress up for the cocktail and theme party nights. When you are walking around Pacific Eden (which was previously Holland America Line's Statendam), it can be hard to believe this classy-looking ship is more than 25 years old. However, despite impressive refurbishments, the ship's age does show sometimes. The cabins, which still feature traditional Holland America decor, look rather tired and out-of-date, especially compared to the ship's otherwise modern look. New carpet and balcony furniture were added to some mini-suites and balcony cabins in August 2017. The Dome nightclub, Marquee theatre, cinema, spa, gym and teen clubs were also revitalised during this most recent dry dock. Aside from a plumbing issue, our overall cruise experience was a good one. As long as you keep your expectations reasonable, you should enjoy this well-priced ship. The predominant nationality is Australian, followed by New Zealanders, although there were some Americans and Europeans on our Papua New Guinea cruise. 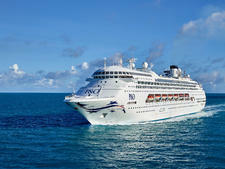 P&O appeals to families but you don't need kids to appreciate the lively yet laid-back onboard atmosphere. Whether you are in your 50s, travelling with extended family or 20-something party people, Pacific Eden offers plenty of fun although the line's wilder days fortunately remain in the past. If you prefer a relaxed cruise experience, with no pressure to dress up, Pacific Eden could be the ship for you. After 5:30 p.m., the official dress code is smart casual. However, it is not unusual to see guys wearing thongs, shorts and their 'best T-shirt.' That said, on theme party and cocktail nights, most passengers make an effort. Think a cocktail dress or pretty frock for women and long pants and a long-sleeved collared shirt for men. Jackets and ties are optional for gents but you will likely see plenty -- plus fedoras and bow ties -- at the Gatsby night. P&O cruises always include at least one themed party (depending on your itinerary), such as Bianco, where everyone wears white, or the Gatsby night, which celebrates the 1920s. Dressing up for these parties isn't compulsory but it is easy to get involved without too much trouble. It's also a lot of fun. For the Gatsby night, ladies can add a feather boa to their cocktail outfit or pay $12 to make an elegant headpiece during the daily activities program; gents might wear a three-piece suit or bow tie with their best mobster smile. If you don't want to join in, simply avoid the areas where the parties are held when the celebrations begin (generally from 9:30 p.m. onwards). 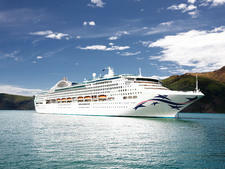 There is no compulsory tipping on Pacific Eden. Gratuities are never added to your onboard account or bar bills. If you wish to reward the crew for excellent service, P&O recommends asking the guest services staff to charge your desired amount to your account. Passengers can also choose to add a gratuity for treatments in the day spa, but it is not expected. The onboard currency is the Australian dollar.